Tank of the Month – How Does It Come About? Since December, 2002, Reefkeeping Magazine has featured beautiful aquariums for its readers to enjoy. Month after month, people have admired the gorgeous images as they poured over the thorough write-up that describes the system in full detail. For some, looking at past Tank of the Month articles is a great way to emulate different aspects of successive coral husbandry with their own setup, new or old. Readers learned about the various hardships and challenges each Tank of the Month owner overcame to achieve a living piece of art in their home. Via each article, they were able to get a personal tour of the livestock, the equipment used, the daily lighting schedule, what is dosed and how the animals are fed. Many describe how they heat or cool their systems specifically, and display growth sequences of corals that they have kept long-term. Another important fact many people want to know are the average water parameters, since they compare those readings to their own current setup. What most readers do not know is how these tanks are selected. Or why they were selected. We would like to clarify the process so that more of you can participate in helping us find that next special tank. If you see a tank that you think is worthy, you can nominate it for Tank of the Month quite easily. At the base of every TOTM article, a clickable graphic will take you to the proper forum. 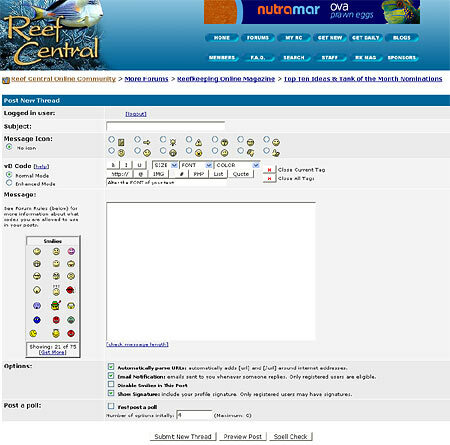 Another way to find that graphic is to check the very first post of the current TOTM discussion thread, always affixed (as a ‘sticky’) at the top of the Reef Discussion forum on Reef Central. Click that graphic to submit your nomination. How long has the system been running? How do the corals and livestock look? Is the reef visually appealing, or does anything detract from it (frag racks, PVC, dirty glass)? What do the pictures look like (are the colors realistic)? Are the images good enough to use? Does the reef look natural, or like a fruit-vendor stand? Have the corals grown in, or does it look like the owner spent significant funds to get an instant-reef? Has the tank been featured in any other magazines (print or online)? What is the hobbyist’s philosophy when it comes to reef keeping? Is the tank a good example for others to emulate, thus qualifying as a future Tank of the Month? If the answers to these types of questions are satisfactory, the owner is then contacted to see if they would like to have their tank featured in our magazine. Next, they are asked to write their experiences into an article. We encourage them to describe in greater detail whatever makes their tank special to them, and even encourage them to include one or two funny incidents if possible. Tank size is not a factor when it comes to TOTM, as even ‘nano’ tanks have been included. Livestock choices may have a bearing on whether a tank is acceptable, but if the owner is providing the appropriate care necessary, that should not become an issue. Some posts indicate that only SPS-intense tanks are featured. This is the case sometimes but largely because reefers that spend a good bit of time on their tanks as a percentage tend to gravitate towards keeping more SPS corals. These corals can be the most challenging of all to keep long-term and many reefers eventually find that challenge hard to resist. All nominations are considered, but we do wonder what readers want to see featured? We try our best to feature tanks that are first and foremost beautiful, with choices of livestock considered a secondary criteria. In the past, a lovely Zoanthid- and Ricordia-dominated tank was featured, and another one was mainly filled with rose bubble tipped anemones. Each person sets up their tank with their own goal in mind of what species they hope to grow into an amazing reef. Some opt for all soft corals, while others lean completely toward a SPS-dominated system. Mixed reefs can be the best of both worlds, if the owner knows how to work with the challenging issues that will invariably occur. All those factors are considered before the decision can been rendered. The equipment the owner uses does not necessarily translate into ‘winning’ Tank of the Month, which we have seen posted often. If the owner can afford higher-end gear, that is both their choice and a perk to their hobby experience, but as was seen in last month’s TOTM article, simple do-it-yourself equipment can do the job as well. If you believe your tank qualifies now, share it with others on Reef Central. You never know who might be reading along, and nominate it. However, if your goal is to earn the title of TOTM on a tank you are only now just planning, it may be years before it is considered. You can not self-nominate. Reefkeeping Magazine prefers that your efforts are focused on the quality of your husbandry, not some honor you hope to achieve. If the tank is pretty, looks healthy and is receiving the proper husbandry, it qualifies once nominated. Whether it is featured or not is up to Team RC to decide. If you love a tank and want others on Reef Central to nominate it as well, that is fine. There is no “vote for this tank for TOTM" process and only leads to confusion as to how they are chosen. Please let others know about this article, so they understand how the nomination process works, and get out there and find us more beautiful tanks!